LONDON — In the showcase event of the Olympic Games, USA and Jamaica had it out in the fastest 100 meters in Olympic history, not long after Sanya Richards-Ross became only the second American to win the Olympic women’s 400m Sunday night at the Olympic Stadium. 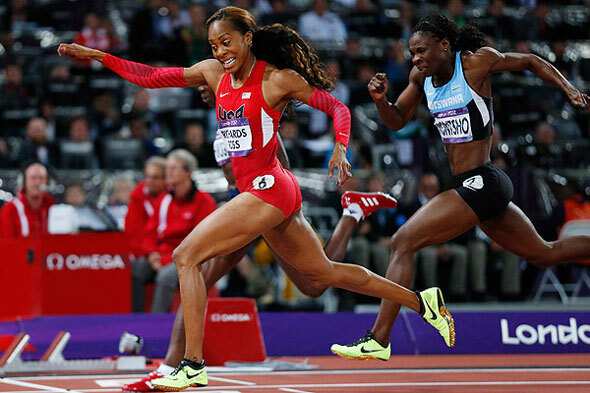 Showing the poise she has waited four years to use to her advantage, Richards-Ross (Austin, Texas), the world’s top 400 meter runner, claimed the 400m Olympic gold medal she had long coveted. With it, the 2008 bronze medalist and 2009 world champion joined Hall of Famer Valerie Brisco-Hooks (1984) as the only American to win the event at the Olympic Games..
Russian Antonina Krivoshapka got out to an early lead and on the final curve was holding on to first. Known for her kick in the final stages of the race, DeeDee Trotter (Orlando, Fla.) put the hammer down earlier Sunday night and took the lead at the top of the homestretch, threatening for the gold. Maintaining her composure and technique, Richards-Ross moved to the lead with 40m left and held off the hard-closing 2008 Olympic gold medalist, Christine Ohuruogu of Great Britain. Richards-Ross staved off her challengers to claim the gold in 49.55, with Ohuruogu second in a season-best 49.70 and Trotter third in 49.72. It was the second-fastest time of Trotter’s career, her fastest time since 2007 and it delivered her first individual championship medal. Trotter outleaned defending world champion Amantle Montsho of Botswana, who was fourth in 49.75, for the bronze. 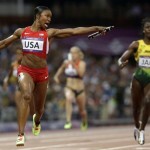 American Francena McCorory (Hampton, Va.) was seventh in 50.33. The men’s 100m had all the trappings of a five-way heavyweight title bout, with some of the greatest 100m men in history vying for the title of World’s Fastest Human at these Games. Lanes 3-7 featured an all-star lineup of alternating Jamaicans and Americans: former world record holder Asafa Powell in 3; history’s second-fastest man, Tyson Gay in 4; 2012’s undefeated Yohan Blake in 5; 2004 gold medalist Justin Gatlin in 6; and world record holder and defending champion Usain Bolt in 7. Upstart American Ryan Bailey was in lane 8. The marquee event drew a full house of spectators including Prince William, Kate Middleton, Prince Harry, London Mayor Boris Johnson and basketball players Kobe Bryant and James Harden. When the gun sounded, Olympic fans saw something they hadn’t witnessed before: Bolt being forced to run – and run hard – if he wanted to win. Gatlin (Orlando, Fla.) got out very well, leaving Bolt, running to his right, slightly behind. With Blake and Gay also out strongly, the question of who would eventually win wasn’t answered until at least 60 meters in, when the long-striding, teeth-clenching Bolt pulled away to win in 9.62 seconds, an Olympic record and the second-fastest time in history. Blake rallied to clip Gatlin for second, with Blake running a personal-best 9.75 and Gatlin third in 9.79, the fastest ever by an American at the Games and a personal best. Gay (Clermont, Fla.) was fourth in a season-best time of 9.80, and Bailey (Salem, Ore.) tied his personal best in fifth (9.88). Churandy Martina of Netherlands Antilles was sixth in 9.94 and Richard Thompson of Trinidad seventh in 9.98. Only an apparent hamstring injury suffered by Asafa Powell kept the race from having eight men under 10 seconds. Powell limped home in 11.99. First through seventh all were the best marks for place in Olympic history, and Gatlin, Gay and Bailey had the best third-, fourth, and fifth-place times in any competition. Earlier in the night, Gatlin’s 9.82 in the first semifinal was the fastest time ever in a semifinal and the second-fastest 100m performance ever at the Games. Bailey ran 9.96 to qualify second out of heat 2, behind Bolt’s 9.87, and Gay was second in the third semi in 9.90, behind Blake’s 9.85. In other finals Sunday night, Evan Jager (Portland, Ore.) was sixth and Donn Cabral (Glastonbury, Ct.) eighth in the men’s 3,000m steeplechase. The two Americans were in first and second with five laps to go and 5-6 with 400 meters left, before the favorites took over. The flamboyant world champion, Ezekiel Kemboi of Kenya, took the gold in 8:18.56, Mahiedine Mekhissi-Benabbad of France was second in 8:19.08, and Abel Mutai of Kenya was third 8:19.73. Jager finished in 8:23.87 with Cabral two places back in 8:25.91. Olympic Trials champion Kibwe Johnson (Sacramento, Calif.) was ninth in the hammer throw with a best of 74.95m/245-10, thrown in the second round. He missed the cut-down to the final 8 throwers by just one place. Kristian Pars of Hungary won the competition with a throw of 80.59m/264-5, Primo Kozmus of Slovenia was second (79.36m/260-4), and Koji Murofushi of Japan third (78.71m/258-3). 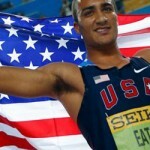 For the first time since 1988 three American men will compete in the high jump fiinal. Reigning World Champion Jesse Williams (Eugene, Ore.) and 21-year-old Erik Kynard (Manhattan, Kan.) tied for third in the qualifying round as they cleared 2.29m/7-6. Jamie Nieto (Chula Vista, Calif.) was close behind, clearing 2.26m/7-5. Leo Manzano (Austin, Texas) and Matthew Centrowitz (Eugene, Ore.) will represent the U.S. in Tuesday’s final of the men’s 1,500m. Manzano easily qualified in the Sunday’s first semifinal heat, placing fourth in 3:42.94. World Outdoor bronze medalist Centrowitz looked very under control, placing fifth in semifinal 2 for an automatic position with a season-best 3:34.90. Andrew Wheating (Eugene, Ore.) placed ninth in the first semi in 3:44.88 and did not advance. All three Americans advanced to the semifinals of the women’s 400m hurdles. T’erea Brown (Miami, Fla.) was second in heat 1 in a personal-best time of 54.72. World champion Lashinda Demus (Palmdale, Calif.) ran 54.60 to win heat 3, and Georganne Moline (Tucson, Ariz.) easily won heat 4 in a personal-best time of 54.31. In the men’s 400m semifinals, Tony McQuay (Gainesville, Fla.) was fourth in heat 2 in 45.31 and Bryshon Nellum (Los Angeles, Calif.) was third in heat 3 at 45.02 and did not advance. Except for 1980 when the U.S. boycotted the Games, this is the first time Team USA will not have a man in the 400m final in Olympic history.